When they hit westerners in small-scale, like the US, Egypt (downed Russian airliner), Lebanon, France, and Mali, murdering 14, 224, 50, 130 and 27 – mostly white people – they are blown out of proportion by media hype and by immediately associating them with links to Jihadist terrorists. Nobody asks who may be behind these terrorists. While mass killings large-scale, like in Iraq, Afghanistan, Somalia, Yemen, Syria, Libya – and many more nations, carried out by western NATO powers, remain largely unreported and are just part of the new normal, the eternal profit-making war on terror. In retrospect all of the small-scale killers, disturbers of our western comfort, curiously, have allegedly police records and were known to the police. And even more curiously, the police was impotent in preventing the massacres. This incapacity of the police in stopping the terror, justifies more police crackdown on civil liberties, gradually making the US – and for that matter the entire western world – to a police state – let’s call it the police Zionist-Anglo-Saxon Empire – that has adopted the right to kill with impunity. Killing to prevent killing. That’s the name of the game. Totally absurd, but the brainwashed to the core western populace doesn’t see it, instead it thirsts for ever more blood revenge. The western media-duped people, heirs of western feudalists, truly believe they are at the mercy of a bunch of jihadist fighters whose only purpose is to disturb their ‘well-being’ and go to heaven as glorious kamikaze-heroes. They cannot fathom that vital western interests, their very ‘democratically elected’ leaders (sic) are behind these killings, that jihadists like other humans are corruptible; that these western interests are easiest materialized by a frightened people that literally asks for more police restraint. In this game the people at large in the US as well as in Europe are willingly engaged – for their ‘safety’. They plead with the state for more protection; they give away their personal freedom for more cameras, more surveillance, more police squadrons patrolling the pavements of LA, Paris, Brussels, London, New York, Chicago, Berlin, Rome — the western world will become an amalgam of police and military-clad armed-to-the-teeth cities. Who would have thought that 70 years after a devastating WWII, the same fascist powers that produced Hitler and his SS murderers would again be able to brainwash people into willing submission – this time on an even larger scale. Killing is not the issue. Fear is. And fear is the ‘soft’ weapon these elitist powers use to subjugate the people into their willing servants. Never mind the western Zionist-Anglo-Saxon Empire instigated mass-killings, the so called ‘wars on terror’ that have killed more than 12 million people over the last 15 years, not counting the ten million African non-people of central African mineral-rich countries. I call them non-people, because their millions of lost lives are not even worth reporting by the corrupt western media. They were and still are being slaughtered in never ending, western armed civil wars for the sake of exploiting their rich lands for rare minerals such as Coltan, being used for electronics such as cell phones, but foremost by the high precision war industry; precisely these murder weapons that allow the west to dominate and kill for greed and power. They kill for the raw materials they need to kill. A never ending cycle of murderous profit making. The epitome of neoliberal doctrine. Of the world’s total 590 tons of Coltan production in 2013, 400 tons were mined in Rwanda, Congo, Central Africa and neighbouring countries under the most inhumane conditions – child labor, prostitution, drug trafficking, controlled by mafia-type terror clans. These millions of Africans that live and die in misery remain anonymous and widely unreported by the western media – which is, hence, serving western capital interests, by leaving western consumers unperturbed. The latest (at the time of this writing) of the series of mass killings in our civilized world is the recent shooting in San Bernardino, California, a working class neighbourhood of Los Angeles, killing of 14 and wounding 21. Obama is warning Americans that we are moving into a new era of terror, requiring new measures of protection, herewith paving the way for more police and military repression. Similar words are heard from of the Secretary of Homeland Security. Not only are these terror acts linked immediately to people with Muslim background and with relations to ‘terrorist organizations’ in the Middle-East, mostly Syria, but they are always extremely well organized, professional killers, well trained (probably by CIA, MOSSAD, MI6 and the like) – and the suspects are immediately murdered by police – silenced. Dead people don’t talk – and cannot be questioned. 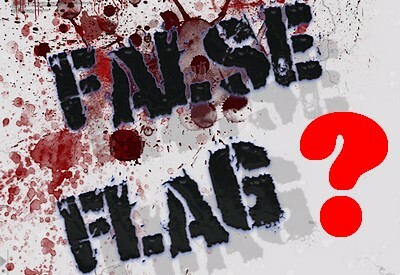 Hence, potential evidence for false flags is drastically reduced, though never eliminated. Just look to the contradictory information on events like the Paris massacre of 13 November or the other Paris carnage at Charlie Hebdo on 7 January – or the absolutely incoherent accounts of the Boston Marathon killers – not to mention 9/11. The San Bernardino case is now firmly in the hands of the FBI which is already assuming that the horrific massacre was a terrorist attack – which it surely was. But by terrorist Washington always, but always means an Islamist attack. Hate against Islam must be nurtured on a daily basis. As usual, the two suspects, Syed Farook, a 28-year-old county health inspector, and his 27-year-old wife, Tashfeen Malik, were slain by the police. They were silenced. They had been “radicalized,” says the police. CNN reports that there were no signs of radicalization. Too bad, nobody can ask them anymore. – The couple had a six-month old child whom they left with grandma during their shooting. Why would they do an illogical thing like that? Leaving behind a new-born baby – for the sake of what? – Nobody can ask them anymore. Conveniently, police has killed the suspects and the witnesses in one. – Was it necessary? Similar in the Paris massacre three weeks ago, the Charlie Hebdo carnage, and with the alleged Boston Marathon killers – one was shot death by the police and his brother was badly hurt, is in custody and not allowed to speak to anyone, other than his appointed lawyer. Any testimony he may have signed was probably coerced by police. These supposed Jihadists / Islamic State organized killing sprees, immediately prompted western responses, starting with police crack-downs, a three-month temporary state of emergency in France that will most likely be extended; and even in Belgium – preventively. Paris and Brussels are under an ‘État de Siège’. Brussels hosts the European Commission and Parliament, no less. Would that be a reason for extra fear – after what their neoliberal troika (ECB, EC, IMF) puppets have done to Greece, Portugal, Cyprus and are preparing for other European ‘heavily indebted countries’, not even mentioning their secret negotiation of the nefarious TTIP – Transatlantic Trade and Investment Partnership – with the United States that would leave Europe for the corporate vultures to be sucked dry and picked apart. – Would that be any reason for fear from a terrorist attack? Spreading and publicizing fear through the media, hyped up police surveillance and patrolling in cities throughout Europe, has become the norm for indoctrination. Fear is the enemy number One. As to immediate revenge abroad, Hollande declared, even before the alleged ISIS claim of the crime was known, that the Islamic State was the perpetrator, that evidence exists, that he knows who the culprits were that they came from Syria (later ‘proven’ by a coincidentally lost passport of one of the kamikaze bombers who couldn’t speak anymore). Hence, Mr. Hollande was dispatching the nuclear powered aircraft carrier ‘Charles de Gaulle’, Europe’s largest, to Syria, were three days later French Rafale and Mirage 2000 fighter jets carried out bombing raids on Syria, presumably alongside Russia, but most likely spineless Hollande would not dare to differ from Washington. Doesn’t it wring wrong in the head of any lucid citizen that an aircraft carrier plus accompanying fleet can be readied for war within three days? That the assault on Syria must have been prepared way ahead and the Paris massacre was a convenient trigger? Or was the convenient trigger planned by ‘insiders’? – Especially since France is a logical target for Islamic payback. The French have been meddling in the MENA region for years. France led the NATO attack on Libya, assailed sovereign Mali in 2012 for an alleged Touareg rebellion (Mali has uranium that France vies for), and then sent troops to Central Africa where a fierce western-alimented civil war wages for rare minerals. The French were also involved in destabilizing Syria from the beginning, in 2011 alongside CIA and Saudi Arabia. Now Germany will join the group. Which group? – The US, UK, and the French, of course. Not the Russians, as Merkel may have insinuated a few days earlier. That would be unacceptable for Washington; and the Germans like the French do not want to test the goodwill of their Master. On Friday, 4 December, the German Bundestag voted overwhelmingly – 445 to 146 (7 abstentions) to send 6 Tornado Reconnaissance jets and deploy a frigate to ‘protect’ the French aircraft carrier Charles de Gaulle (protect from whom or from what?). Berlin may also send up to 1,200 “support” troops, boots on the ground, euphemistically called ‘military personnel’. This is an action in direct violation of the German Constitution (Basic Law for the Federal Republic of Germany, signed after WWII in 1949) which prohibits any aggression on another nation emanating from Germany, as long as Germany is not being attacked. – It looks like to please the Master in Washington, abrogating one’s Constitution and sovereignty is of the order – and that even against the will of the vast majority of the German people. As soon as a ‘terrorist attack’ hits one of our western cities, our leaders are ready to retaliate, retaliate against a pre-conceived enemy – and this enemy is unwaveringly in the Middle East, wherever the Zionist-Anglo-Saxon’s interests are. Right now the masters in Washington have decided it is in Syria, earlier in this century they were in Afghanistan, Iraq, Libya, Iran, Yemen – but now, the next step is dividing and subjugating Syria, to cut her up in small parcels of different rivalling Islamic sects, to create chaos – chaos à la Libya, Sudan, Yemen, Iraq. Divide and conquer. The current phase of the Big Plan of the Big Dictator, the western Empire with seat in Washington, is to dominate the oilfields of the entire Middle-East, to move ever one step closer to the last vestiges of resistance – Russia and China. The objective of the next phase of the Big Plan (the PNAC) is most likely going to be Full Spectrum Dominance – with or without war. Let’s not forget, according to such prestigious main stream media like the Washington Post: War is good for the economy. Back to the US crime scene. Did you know that the average American is 9 times more likely to be killed by police than by a terrorist? Thousands of Americans have been executed over the last 15 years by US police, no conviction, no trial, just sheer murder. In 2014 alone at least 1,104 Americans were assassinated by US law enforcement. That makes about 3 a day, every day of the year. Nobody talks about this state terrorism. We are not allowed to know, lest we might think twice before yielding to the state, the police, the military the power to ‘protect us’ from terrorism. It doesn’t occur to the average American or European for that matter that hate breads more hate and murder more murder – and war more war. The Old Testament dictum of an eye for an eye is well alive and ticking. Christianity – the New Testament – which we pretend to practice today, the theory of turning the other cheek, is nothing but hypocrisy. That omen of peace, taken over from the 12,000 year old theory of Tao (Tao Te Ching), pertaining also to the Christian doctrine, is far from our hearts and minds.Whenever the theory of Tao has been applied throughout civilizations, evil has been defeated. And we, who pretend to be Christians, are the most violent, murderous and greedy civilization that has walked our planet in the last 5,000 years. It’s time to sit back and reflect – and then rescind the terror which we initiated in the west, by what we already know – peace by non-aggression, non-retaliation.